CSC Transportation LLC is a private carrier owned by Commodity Specialists Company, a Minneapolis-based agricultural trading and marketing company. CSC Transportation LLC primarily handles animal feed products with an operation that includes 64 tractors, 75 trailers, 100 company and contract drivers, and over 650,000 tons of product hauled annually. CSC Transportation LLC began its private carrier business in 1993 as a contract hauler of wet brewer’s grain, the by-product grain that is generated from the process of brewing beer. Wet brewer’s grain is primarily sold into the dairy and cattle feeding industries. The grain is mostly shipped directly to farms, both large and small. CSC Transportation LLC is also an active back hauler of other commodities, such as wheat midds, cottonseed, corn, salt, mulch, and aggregates. CSC Transportation LLC is geographically dispersed — Columbus, Ohio; Baldwinsville, New York; Cartersville, Georgia; Williamsburg, Virginia; Jacksonville, Florida; Albany, Georgia; Fort Collins, CO; Merrimack, NH; and Elkton, Virginia. 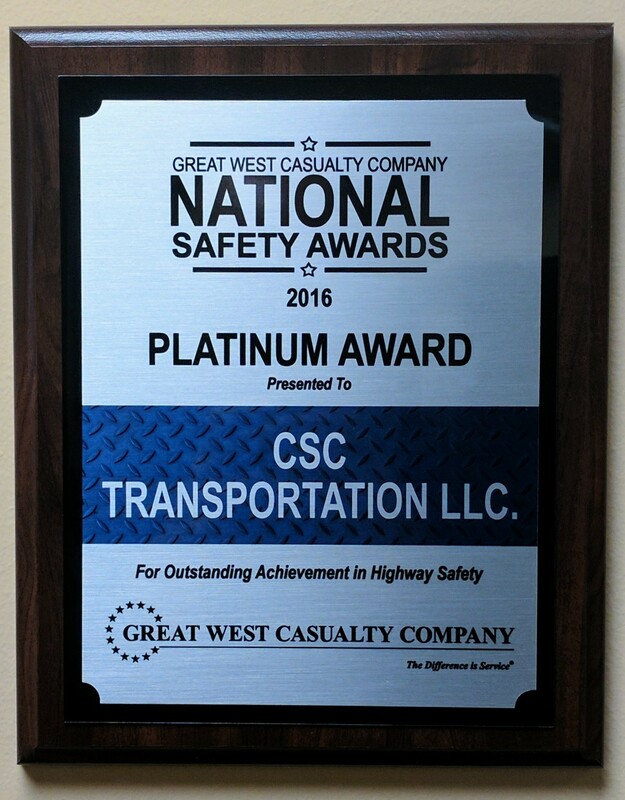 In 2010, 2011, 2012, 2013, and 2014 CSC Transportation LLC received National Safety Awards from Great West Casualty Company. The National Safety Awards Program recognizes carriers for preventable accident results.